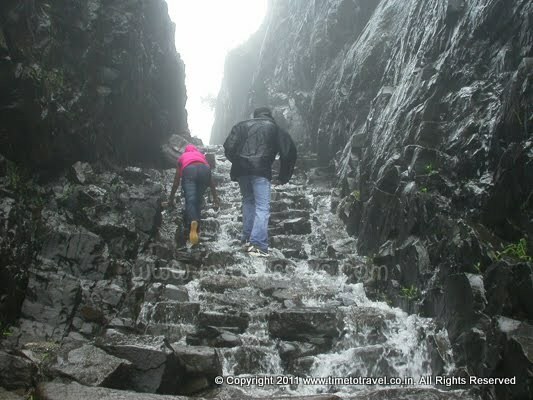 Naneghat : Had been missing monsoon treks for quite some time now. Hence, was keen to make one monsoon trek this year. Mumbaihikers yet again provided the options. With lot of trekking groups publishing their itineraries on the site, we opted to go with best of the lot - YHAI Mumbai unit. They had pickups across Mumbai at Sion circle, Amar Mahal Ghatkopar and Teen Haath Naka with the starting point near Dadar Station Jain Temple. We had to reach the place at 6.00 am. There were other fellow trekkers there. We did some chit chat as there was some delay. The bus came around 7.00. It was in fact a school bus. Most people who were supposed to join the group at Dadar had already arrived and we were all set to go our adventure to Nanaghat.